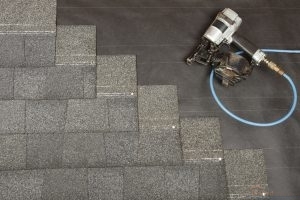 HomeBlogUncategorizedAre Your Roof Shingles in Good Shape? Are Your Roof Shingles in Good Shape? When is the last time you took a closer look at your roof? Sometimes, roof damage isn’t easy to spot from the ground. Your roof may seem fine from where you normally stand, but roof shingles may have cracks, or be loose and you can’t tell. That’s why you should have professional inspections once or twice per year. Cracks are sometimes only noticeable from up close. Just because they’re tiny doesn’t mean they can’t make a difference. Those cracks mean that your shingles are on their way to further damage. Just one strong storm may be enough to turn those cracks into more severe damage. Plus, those cracks may let water in. While a few drops of water in the cracks may not seems so bad, that moisture causes its own roof damage over time. You also might not notice if your shingles are loose. Loose shingles also let moisture in, but, even worse, with a strong wind they can be blown right off your roof. Obviously, this is a sign of fast-developing roof damage. Damage like this should be repaired immediately. In fact, all damage should. No roof damage should be left as is for any longer than is necessary. Since you cannot see all roof shingle damage you may have, you need someone to get up on your roof who knows where to look. That’s where roofing professionals come in. Call United Roofing Services for all your roofing services in Grain Valley, MO. Call us at 816-228-1158 today. Posted in Uncategorized on January 29, 2018 at 5:28 pm by United Roofing Services.